Republican Michigander: Dems lost due to Gerrymandering? BS! That's their talking point. That's pure BS in the lies, damn lies, and statistics area. What Selweski doesn't get is the following. 1. Candidate quality. Candidates vary from district to district. 2. Geography. Obviously, votes aren't spread out evenly across the state. State rep districts range from about 77,000-91,000 per district. 3. Self Packing. This is the big one and relates to geography. Most of the Michigan democrat vote in this state is clustered. Detroit. Upper Downriver. Metro Airport area. South Macomb. Southeast Oakland. Pontiac. Ann Arbor/Ypsi. NW Ingham County. Flint and Northern Genesee suburbs. Saginaw. Kalamazoo. Grand Rapids (City). Muskegon. Marquette. Bay City, Battle Creek and Jackson to a lesser extent. That covers most of it. When these democrats pack into an area on their own, funny districts don't need to be drawn to get skewed results. 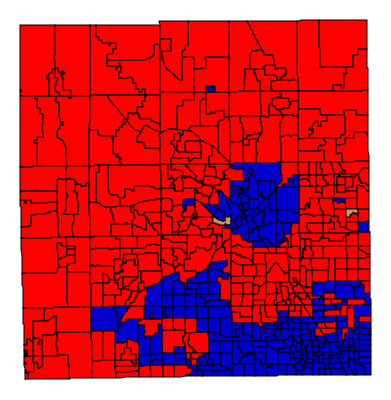 Here's the straight ticket vote from Oakland County as an example, by precinct. Straight tickets went 50-49% dem in Oakland County this year. The vote is clustered. Pontiac, a little of Auburn Hills, and a small part of Waterford (competitive, more GOP than not overall). Then you have Southern West Bloomfield, Wixom's village area, some apartment areas of Novi, and Eastern Famington Hills in one area. Then there's Southfield roughly east to the county line. This is self packing. All of Pontiac is in a district. Auburn Hills is with Pontiac. That makes perfect sense. Farmington Hills is in a district to its own (with Farmington), as is Southfield. Royal Oak I believe has next door Madison Heights. The SE cluster is all together as well in a neatly shaped district. That's gerrymandering? Some of those districts haven't changed for years. Here's the general guidelines for state legislature districts. You also have federal issues regarding race, etc that factor into some of the Detroit district shapes. 4.261 Redistricting plan for senate and house of representatives; enactment by legislature; guidelines. (a) The senate districts shall consist of 38 single-member districts. (b) The house of representatives districts shall consist of 110 single-member districts. (c) Senate and house of representatives districts shall be areas of convenient territory contiguous by land. Areas that meet only at the points of adjoining corners are not contiguous. (d) Senate and house of representatives districts shall have a population not exceeding 105% and not less than 95% of the ideal district size for the senate or the house of representatives unless and until the United States supreme court establishes a different range of allowable population divergence for state legislative districts. (e) Senate and house of representatives district lines shall preserve county lines with the least cost to the principle of equality of population provided for in subdivision (d). (f) If it is necessary to break county lines to stay within the range of allowable population divergence provided for in subdivision (d), the fewest whole cities or whole townships necessary shall be shifted. Between 2 cities or townships, both of which will bring the districts into compliance with subdivisions (d) and (h), the city or township with the lesser population shall be shifted. (g) Within those counties to which there is apportioned more than 1 senate district or house of representatives district, district lines shall be drawn on city and township lines with the least cost to the principle of equality of population between election districts consistent with the maximum preservation of city and township lines and without exceeding the range of allowable divergence provided for in subdivision (d). (h) If it is necessary to break city or township lines to stay within the range of allowable divergence provided for in subdivision (d), the number of people necessary to achieve population equality shall be shifted between the 2 districts affected by the shift, except that in lieu of absolute equality the lines may be drawn along the closest street or comparable boundary. (i) Within a city or township to which there is apportioned more than 1 senate district or house of representatives district, district lines shall be drawn to achieve the maximum compactness possible within a population range of 98% to 102% of absolute equality between districts within that city or township. (j) Compactness shall be determined by circumscribing each district within a circle of minimum radius and measuring the area, not part of the Great Lakes and not part of another state, inside the circle but not inside the district. (i) The city must be split to stay within the range of allowable divergence provided for in subdivision (d) and it is practicable to keep the township together within 1 district. (ii) A township island is contained within a whole city and a split of the city would be required to keep the township intact. (iii) The discontiguous portion of a township cannot be included in the same district with another portion of the same township without creating a noncontiguous district. (l) Senate and house districts shall not violate the precedents established in Miller v Johnson, 115 S Ct 2475; 132 L Ed 2d 762 (1995); Bush v Vera, 116 S Ct 1941; 135 L Ed 2d 248 (1996); and, Shaw v Hunt, 116 S Ct 1894; 135 L Ed 2d 207 (1996). This stops the dems from baconstripping districts from Detroit to Livonia or Livingston County for that matter to get these districts to fit the results they want. This goes back 20 years due to some of the 1970's and 1980's era democrat gerrymanders out there. Some of these aren't "perfect" in their breaks, but county breaks and municipal breaks are fairly uncommon in these maps. As long as democrats self pack into places like Detroit, there's going to be skewed results between popular vote for an office by party, and the winners by district. There's nothing wrong with that as we have DISTRICT offices as well as state wide offices. Is not a talking point, its a fact. To try and claim “self-packing” is the reason for gerrymandering makes you look even more partisan and dumber than you really are. Who moves to a place because the Democratic base is higher than somewhere else? The answer, no one. It’s long past time to end gerrymandering, and go back to voters choosing politicians instead of politicians choosing their voters like we do today in Michigan. Now, because no Republican candidate can win in Michigan, they are going to germander the Presidential election with Lund’s Electoral College Scheme. It's not about how a voter "moves to a place" due to the partisanship, dumbass. It's where the voters live at the time the census was taken. It's a fact, the democrats are concentrated in particular cities/townships. It's also a fact that the number of splits within districts needs to be limited. Detroit is 93-97% democrat. That's going to dominate 10 districts. Flint has two seats. Saginaw has one. Ann Arbor has two seats. Ypsilanti has a seat. South Macomb is concentrated. Lansing and East Lansing are concentrated. Muskegon is concentrated. You just saw the Oakland map and the concentration of votes there. Those are democrats concentrated together. Those are communities that vote for democrats by high margins and sets up your talking point or delusion of thinking that voters prefer democrats when they don't. No, it’s gerrymandering, and you trying to spin it as otherwise, dumbass. You’re the one who has been making the case about how much population Detroit is losing, but in the next sentence you are saying the reason Democratic Michigan House candidates got more than 61,000 votes than Republicans that enabled Republicans to increase their majority was because of the huge Detroit population. Kevin, you would know about dishonest hacks. 77,000-91,000 people live in a district. This is based on 2010 numbers. People leaving won't affect district drawing until 2020. Detroit is a base in 10 districts. That's just a start, and we don't really have to split municipalities for these. These don't need to be cracked to gain seats. That is self-packing. I do: I have been reading your crap, lies and spin for some time. Nice try on spin. What possible reason could you have for opposing something the Michigan League of Women Voters support? Gerrymandering is the reason Congress has a 13 percent approval rating and has accomplished less than the Do-Nothing Congress of the 1950’s.